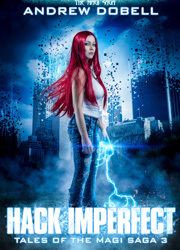 Set primarily in the modern world, initially on Earth, this Urban Fantasy Series follows Amanda-Jane Page, "a scruffy, lovable scamp" who discovers a world of Magic, adventure and danger with a hidden Civil war between the Magi factions. Amanda must learn how to use Magic in order to survive, learn of her true heritage and her destiny. Below you will find links to the first 7 books in the Magi Saga. such as Star Magi, Wasteland Road Knights, and Quantum Legends. And there’s more to come!!! With the number of books growing, and the story getting more complex, knowing that to read next can be tough. Tales is a collection of short stories that are set within the Magi Saga universe. They detail events not shown in the main series, and often feature new or side characters, along with your favourites from the main series. Angel of Tarut is also available for free by signing up to my mailing list. After the events of book 7 of the Magi Saga, the world and the fight has changed, but Amanda's fight is far from over. Follow Amanda's continuing adventures in STAR MAGI, book 1 of the Star Magi Saga. Set within a distant part of the Magi Saga universe, this Post Apocalypric tale follows the adventures of two survivors on a ravaged world, filled with Zombies, Mutants and worse. who she shares a drink and some stories with. Below you can see some galleries of the Artwork I have created for the series. I hope you enjoy browsing it.